If your property is surrounded by tall trees that are hard to reach, hiring an experienced crane and bucket truck service is an excellent option. Not only do bucket truck services make it easier to reach these trees, but they are also a safe method. How Does A Bucket Truck Work? 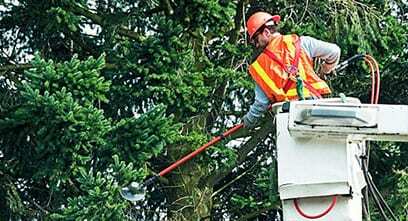 The bucket truck, also known as a cherry picker, has specifically mounted equipment that lets an arborist gain access to all the trees located in places you cannot easily reach. While working with a tree, the crane is effective for moving the bucket to remote places. The arborist can then perform the necessary work. Pruning helps the health of your trees to grow properly. It involves the careful removal of dead branches so that the overall growth is not affected and can continue properly. Pruning also helps to correct the biased growth of trees. People with a beautiful landscape coupled with tall trees will realize the need and value of cabling their trees. A fallen branch or weak trunk can cause immense damage to your property. You can avoid this with cabling by tying and keeping the whole tree together. It will also help in extreme weather conditions. With the help of bucket trucks, an arborist can install the cables and bracing rods easier and in the best locations, providing the trees with a stable structure. There are trees that seem impossible to reach but are a hindrance to your property. Such trees that are inconveniently located between utility wires or other structures can be efficiently removed with the help of a crane and bucket truck. Trees can get sick and infected with different diseases. Such infections can pose a threat to the other trees in your yard. It is advisable to opt for removal with a bucket truck to get rid of them. Dead trees may fall when left alone, damaging your property, and costing you a lot more than actually removing the tree. Tree removal with the use of a crane and bucket truck ensures that your property experiences minimal damage while removing the tree. Always choose an experienced and professional company for removing the trees from your property. The specialists will be more aware of the possible dangers of the process, helping you to do it safely. Contact DreamWorks Tree Services for help removing hard-to-access trees. Our experience and expertise will provide safe tree removal from your property. Call our tree service specialists today at 647-261-2627 or toll-free at 1-800-407-9917. You may also reach out to us for a free property assessment.